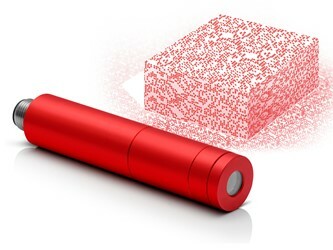 Bedford, NH: LASER COMPONENTS USA, a specialized provider of laser and optoelectronic components in the US and Canada, is proud to present the FLEXPOINT MVstereo laser module generating truly random patterns with 31,806 or 47,708 dots. These patterns are generated completely randomly; even in partial patterns, repetitions do not occur. The range of pseudo random patterns has also been expanded: Versions with 40,100 and 29,594 dots are now also available. Due to the different number of dots and the different fan angles of the patterns, the customer can choose the optimal optics for his application. Both versions are available with red (660 nm) or NIR (830 nm) lasers, and both are eye safe (laser class 1 and 1M).